Noun: A cause of great distress or annoyance. Generally, there are few things in life I consider to be actual Banes to me, but they certainly do exist. Brooms, for example. I can't keep one intact for more than two weeks. My current broom is actually more a "broo" as it's missing two-thirds of its handle. Laundry is another - no matter how much I do, no matter how well I manage to catch up with it, it breeds in a dark corner and reappears within moments of me declaring "I'm sodding well done!" Tonight, I discovered a new bane. Now, assuming you read here relatively often, you know that most things gadget & geek are my bread and butter. Give me a bit of kit or equipment, and within a relatively short space of time, I've worked out how it works without having to RTFM. Today, Kellie came home from work with a laminating machine. I assume that's what they are called the world over, but basically, you put a bit of paper into a laminating pocket, put that pocket into a cardboard pocket, poke it in the machine that gets hot, it pops out the other side, and when you open it up, your paper is sealed away nice and safe. Think Han Solo+Carbonite, except in this scene, Han is played by "Paper" and Carbonite is played by "Clear Plastic"
OK, so we're now clear as mud on the doohickey machine. Good. Tonight, Kellie had to finish off a handful of Christmas Cards for work, and then laminate a load of menus for the staff Xmas Party. Being that I am, in fact, brilliant, I uttered the phrase that will haunt me forever. "I'll do the laminating, you do the cards" thinking, like any sane man, that I'd be done in half an hour. Hooooo boy was I wrong. First off, I've never laminated before, but I get the concept. Lucky for me, Kellie showed me Step Two of the process, which involves putting the laminating sleeve into the cardboard sleeve before jamming it into the Hot Fiery Machine of Death. THAT would have been interesting to explain to her boss - who also happens to be the father of her best friend. So, Sheet of Paper, insert into Laminating Sleeve, insert into Card, Poke into Hot Fiery Machine of Death. Sheet of Paper: Yep, got that, it's a bit of paper. Easy peasy. 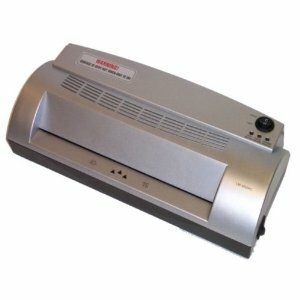 Laminating Sheet: Oh My GOD! It's got me help help! These things, my friends, are where electricity in all its forms is created. There is SO MUCH static on these that every time I reached for them, my arm hairs reached in unison with my actual arm. Sheet of Paper INTO Laminating Sheet: OK, let' imagine you have the stickiest substance known to man, and you have to open it up, insert something INSIDE IT, align it, then close it up. BUT while doing this, the open side of the sheet is grabbing a hold of the other sheets on the pile, so you move it sideways - which drags the pile across the sofa, which IN TURN grabs all the fluff and dust on the sofa. So you shout and swear at it, and then move it further and oopsie daisy you've now caught the pile of Sheets of Paper. Imagine the scene, dear reader. I am sat, on the sofa, trying to put a piece of paper into a folded piece of plastic, with three additional sheets of plastic dragging on one part, and three sheets of paper on another. The cats, I should add, gave it one sniff and ran for the hills. After all, it probably felt like every fibre of their fur coat was being pulled towards this plastic sheet. EVENTUALLY, our hero gets the paper INTO the laminating sheet. And closes it. Now to put it into the card, but ho ho, this isn't just bog-standard card. No folks, this stuff has a shiny coating on the inside - that the stupid arsing sodding laminating sheet sticks to! Another wrestling match ensues, and finally I get the stupid stuff into the stupid card. The machine - with it's maws of doom spouting fire and brimstone - awaits its meal hungrily. So, carefully, I poke it in and wiggle it... And.. Nothing. Wiggly wiggle. Pokey pokey. Just eat it you stupid bloody machine! EVENTUALLY, our hero manages to force-feed the machine with it's little sandwich. Om nom n- wait a minute. Have you ever seen an old lady crossing the street. She knows the cars are sat waiting for her, she knows they can't budge, and you just know that she slows down on purpose. This is the Hot Fiery Machine of Death. I've seen dead slugs move faster. And the noise! Holy crap it's like judgement day really was upon us. So, to recap. Paper. Plastic. Static. Anger. More Static. More Anger. MORE Static. Card. YET MORE Static. Boiling Rage. Hot Fiery Machine of Death. Slowest Speed Known To Man. Finally, after hell froze over and then defrosted (thanks entirely to the Hot Fiery Machine of Death and it's heat output!) the cardboard sarnie pops out the back. Peel it open and Oh-My-God-It-BUUUURNS!